Thanks to everyone who came to San Diego and made this one of the most energetic and interactive shop management workshops we’ve ever held. Here Comes our First Shop Management Workshop of 2016! 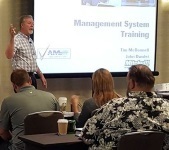 We’re very excited that our first shop management workshop of 2016 is coming back to San Diego! The workshop will be held May 12-14, and will guide you through all levels of functionality of the Manager™ SE shop management software. Manager Tip #4: How can I “Tag” specific customer records?